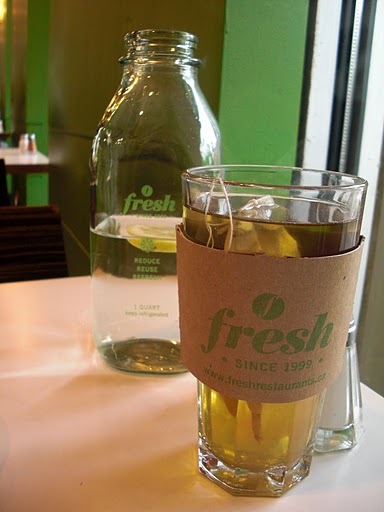 Fresh is an incredible small chain of vegan restaurants in Toronto, Canada. While they do offer dairy products as a “side” item, everything on the expansive menu – salads, wraps, soups, “bowls” and burgers is made from fresh, vegan ingredients and loads of vegetables. Fresh also features a full juice and smoothy bar with enough options to fill half of the expansive menu. And, if you’re the sort of person who likes take-out, we offer a 15% discount to customers who bring in their own bottles or bags for takeout orders. In general, I had a hard time choosing what to eat – I’m just not used to having so many wonderful vegetarian options. 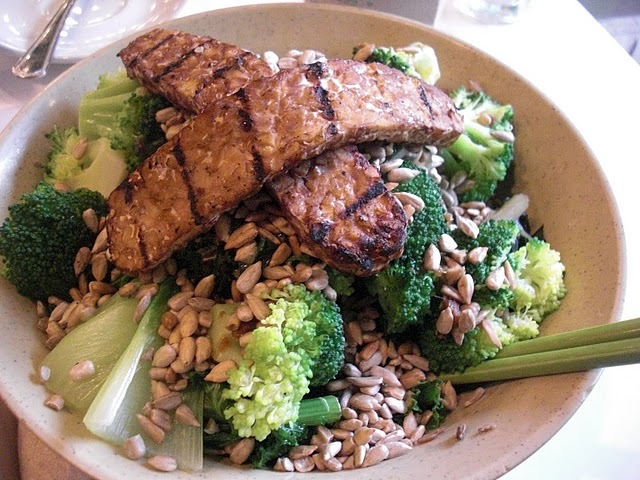 Pictured above is the green goddess bowl on brown basmati rice: steamed bok choy, kale, swiss chard & broccoli with grilled tempeh, pickled ginger, toasted sunflower seeds, tahini sauce, toasted nori & ginger tamari sauce. Just the perfect amount of crunchy, hearty and savory, I love the bowl. I paired the goddess bowl with a sweet ginger tea to fight the cool and rainy Toronto weather. The only question is, how do we get a Fresh in Philadelphia? wow..looks real good. I am gonna try to make that at home. The tahini sauce, was it just lemon juice/salt/ tahini or other spices like garlic, cumin or cayenne? Scott – there was definitely some garlic in there!